Back again already. Hammy and I are experiencing an after-purge surge and having lots of fun, but our hearts go out to those of you being buried in a spring blizzard. Please stay cozy and warm and I hope the power doesn't go out so you can hunker down and get crafty until it blows over. We come to you today bearing fruit! I've come across a treasure trove of die cuts that bloggie friends have kindly sent to me over the years. I'm sorry I misremember who gave me what, but I'm pretty sure they came from either Andrea, Greta, Susan, Barb, Cat, or maybe you. Thank you, again, whoever you are! In the trove were two sets of three pears, die cut in white. So I did what anyone with white pears would do ~ I smooched them. Onto my craft mat went schmears of Distress Inks in pretty pear colors, which I doused with water via my mister (no capital). The pears were then put face down in the pool where I smooched them around until they looked less like bleached eggplants and more like pears. As one does. After a gentle splatter of dots, I dried them with a paper towel and sent them across the room where Hammy lathered them with Stella until all six of them schparkled in the sunshine. For the first card above, I started with a cream colored card base splattered with some diluted old olives. I got down my grandma's antique mixing bowl, made by Judith. I stamped and polished it with a bit of canyon clay, fussy-cut it, and arranged the pears in and around it on a place mat of SU ribbon. You can just see the scored edge of the kitchen counter. The sediment is a NBUS stamp from SU's "Tin of Cards," also stamped in canyon clay. Thazit, done. CAS Mix Up: First Birthday ~ congratulations!! Stamping, smooching, die-cutting, fussy-cutting, scoring, and splattering. 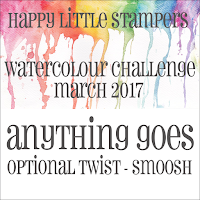 HLS March Watercolor Challenge: Optional twist: Smooch. I kept the second card very QACAS. I took a piece of pp, outlined it with my black marker, and scored three lines along the bottom to make little stairsteps for the pears. I then took Hammy's bedazzled fruit and scattered them placed them artistically on the stairs. I see that I have a pair of pears on the stairs. Stop that. The stamped NBUS sediment is from Hero Arts. I attached the panel to a rustic cream card base and went to the grocery store. For some reason, I had such a craving. Fabulous both the pears cards, and love expecially the first one with that vase and the dotted ribbon, how pretty scene!! 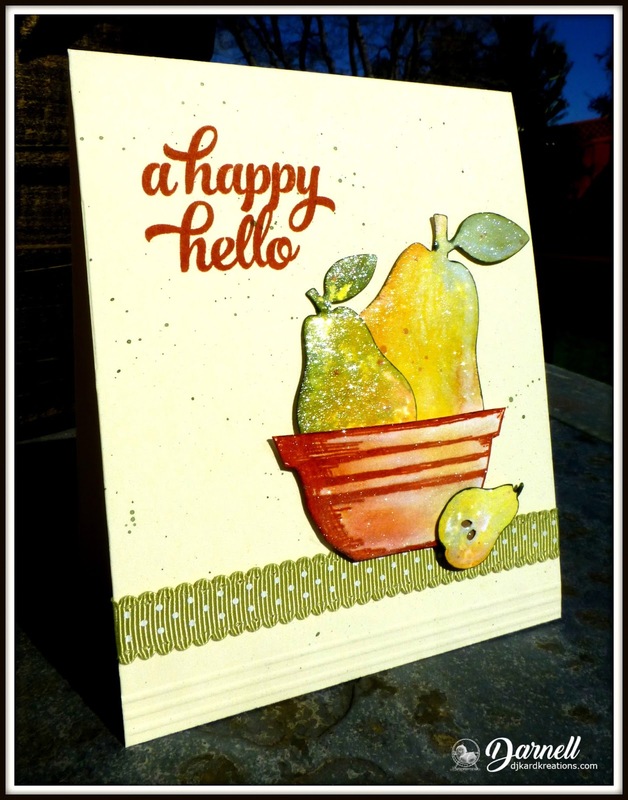 great pear cards, I love that ribbon and perfect smooshing! a super pair of pear cards - what fun! Darnell it's so good to see you! And you created two stunning cards; I love them both! Thanks so much joining us at CCCB! So happy you could join us! Wow - what amazing smooshing! Your pears look good enough to eat and would grace any flat fruit bowl in the land! I like both cards but the first one is just stunning and reminds me of a still life painting. Hi Darnell, The cards are great. Fabulous cards Darnell. Those pears do look good enough to eat too. Oh my... The colouring on those pears is amazing!! Fabulous cards Darnell! Thanks so much for playing along at CCCB!! Two fantastic cards Darnell, I love the smooching on the pears they look so realistic. Good enough to eat. 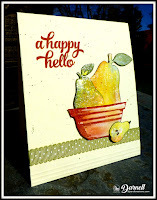 Beautiful pears with all your smooching and shine...both are fabulous cards, and I think that might be one die I don't have is pears, but I imagine my Cricut does...hmmm!! Beautiful pear cards ! Your smooching is fabulous!! Love your pair of pears! The coloring after smooching is just WOW! Great cards Darnell - and yes, I'd head for the grocery store too. Yummy looking. Beautiful pair of pear cards. The pears look real enough to reach in the laptop and grab one for a midmorning snack. Wonderful use of those found pears. I especially like the lovely colors you got on the pears for the first card. You deliberately used 3 so no one could say nice pear didn't you lol? Thank goodness you clarified the Mister/mister as it did conjure up an image of how the dousing took place. Gorgeous cards that look good enough to eat. A perfect pair of pear cards, Darnell! Love how the smooshing gives them such a realistic look! Now you have me craving pears too! Thanks for sharing them with us at CAS Mix Up! Oh your pears are divine!! I LOVE how you layered them together!! The smooshing is fabulous!! Too funny, but I sure do love these smoochied pears! 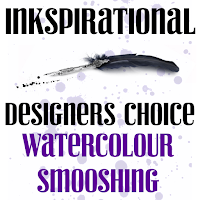 I will never look at my Distress Inks the same way, without looking for pear colors! Your pears look so real and, holy cow, look at the sparkle! They're like magical pears. Love that Canyon Clay ink. I'm feeling a pear craving now, too! Fantastic smooched pears. Such lovely cards, Darnell. Sensationally smooched and stella-ed pairs of pears on the stairs and in the pottery wares (stopping right now!)! You've captured pear colours perfectly, so much so that I'm craving one of those juicy gems right now! Then again, they are sooooo lovely as decor...Thrilled to see your gems in the Ink gallery! As much as my smooching proved a struggle, something about the technique is appealing; perhaps we'll see some smooshes from me soon..maybe...thinking about it! We're in the midst of a chinook, which is bringing warmer temperatures with a mix of snow/rain that, inevitably, freezes over night and creates a ruckus with driving. Me: staying hunkered down and crafting as much as possible for the next few days. A move's afoot!! Downright yummy! And Hammy did a fabulous job winking them! The pears on both of your beautiful cards are so well colored. I love them! Beautiful smooshed pears. They turned into lovely cards. 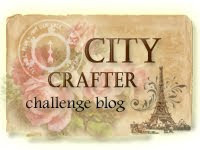 Your blog is fun to read. Love your snooshed pears. The look very life-like. Great cards. Love your smooshed (smooching) pears! Especially the first one in the lovely old bowl. I had no idea Hammy could be so helpful. I wonder if I could train the spaniels to apply the Wink of Stella - or better yet, any glitter I use so that they end up sparkly instead of me. Then I could avoid the bemused comments I get from friends when I show up with glitter on one cheek. Thanks for joining us at CAS Mix Up. Dare I say it? What a perfect pear...(that was so bad. Insert huge groan, here.) I do love the smooshing you did...surprisingly, without producing any juice. Seriously, clever use of those gifted diecuts and that terrific bowl. Love both these delicious cards. Your smooched/smooshed pears are delightful. Both cards are wonderful but I really love the first with the bowl. Fabulous cards Darnell, great image and colours, these creations certainly haven't gone "pear shaped"
A perfect "pearing" Darnell, your colouring is beautiful! Oh gosh these are pretty Darnell!! You've colored the fruit perfectly and your clay bowl looks so real!! As always, very creative, beautiful cards! Those pears are so perfectly smooshed, they look real! And tell Hammy, he did a great job winking them! Adore the cards you made of those pears! Great job! Your smooshing is pearfection -LOL!! I thought they were smooching:) I love the look of the pears in both cards and that effect looks pearfect:) Both cards are fun and spring like....much needed as we have been hammered by snow. We had nothing all winter until today. Awesome pears! love the smooching and stella. 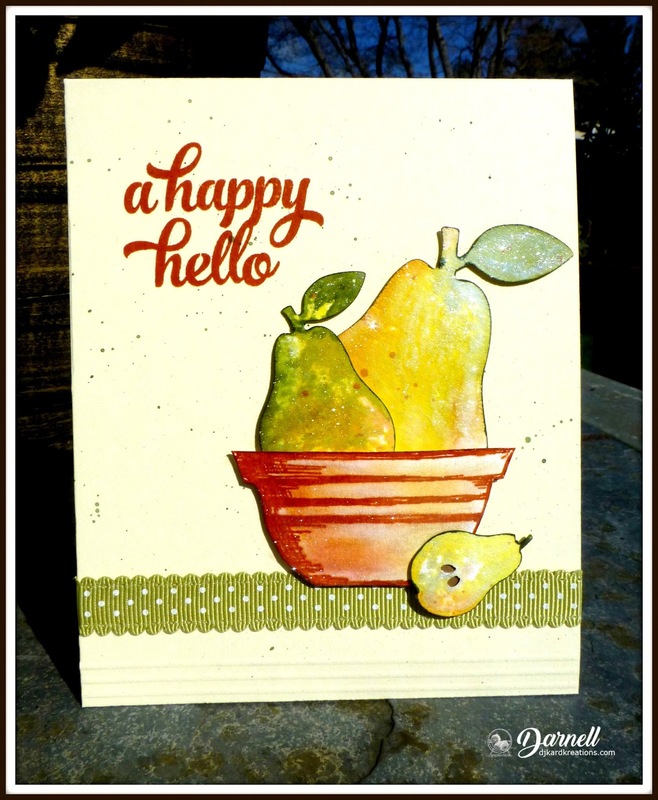 Two yummy cards with appetizing pears ! Your smooching is absolutely stunning because it really looks like the skin of pears ! And your bowl is also amazing, my grandma and my mother also had this kind of bowl ! Love your second card too with this beautiful sentiment (it is my blog's quote !) !! Thanks so much for sharing and inspiring ! Two beautiful cards and perfectly smooshed. They do look real. So does the bowl on the first card. The pair of pears look better on the stairs than they would have looked sitting on chairs. As far as your surge to purge - I have the urge and I'm almost on the verge. Okay, I'm done. How nice of the ladies to send you die cuts and to see how well you've used them. Hammy has become quite the crafter! oh my word I think we are all going shopping after seeing these as they do make your mouth water so. They look so realisticand lovely. Super designs too, and that bowl is gorgeous. Right I off to buy some pears now your have started a craze, and my mouth is watering. lol. A perfect pear of cards Darnell! The smooching makes them look very realistic. The first one made me think of a retro 1950's style picture! Wow, love your gorgeous pears, although the bleached eggplant look does have its charm in certain lights too. I only recently tried the smooshed ink technique myself and it might become my favorite go-to because it's easy, fun, gives nice shading and texture, and sometimes you end up with something like this! This is making me want to die cut a bunch of shapes and make an inky mess in my craft room. what a pair...of sweet cards Darnell. Love your smooching it gives just the right color to your pears...I might have a craving now too. Those are some of the best smooshed pears I have ever seen, Darnell. Fun cards! Love the pears!!! I LOVE pears - to eat and to look at! Yours are beautiful. One of my favorite sweet dishes to make is Pear and Sour Cherry Clafouti. It's so easy to prepare and downright delicious. In fact, there is half a tart pan of Clafouti in my frig as we speak. Two really gorgeous cards. Phew, that's GOT to be all of my 5 fruits and veggies a day!!! (I rarely make it!) Yippee. Ah indeed dear Darnell, everything is better when shared with a friend. Love that saying on your second card. 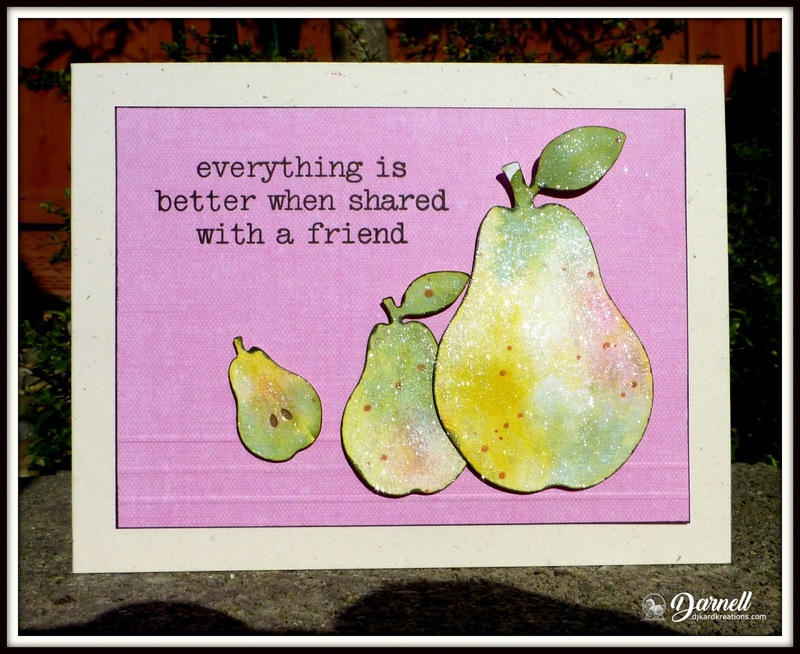 Wonderful card pair of pear cards, dear Darnell 'tis wonderful indeed you've utilised so very well the gifts of a friend. Thanks for popping over and for sharing your inspiration! Such cute cards. Love those pears...I don't like pears to eat though. I hated when mom would pack them in my lunch when I was in grade school. You smooshed them beautifully. Your pears looks like real ones, dear Darnell. You did a great work. I have to read two times to understand all phases how you made them so realistic. Wow! You've colored these pears SO beautifully! Such a pretty card and how fun that you were able to use those die cuts. Fabulous cards Darnell! Thanks for playing along with us at HLS Water Color Challenge. Love your beautiful, sparkling pears, Darnell! I'm glad I'm not the only one who has die cuts from friends not labeled! I didn't send you the pears, but sure is a good thing someone did! You've inspired me to actually use some of the beautiful ones I've been given--think some are even for Easter, so better dig them out quick! Love your beautiful shiny pairs of pears and your very entertaining stories on how you went about to make the cards, Darnell!!!!! You are such a treat!!!! Darnell your smooshed pears are fantastic! Thank you for joining the HLS Watercolour Challenge. Two really gorgeous cards, Darnell! Both are so artistic, especially with your splatters! As always, you and Hammy have done an amazing job! How nice that everyone sends you goodies...you are so deserving!